Posted in Blog Hub and tagged twpweek1 on June 7, 2015 by admin. Posted in Blog Hub and tagged twpweek1 on June 6, 2015 by Christina Hendricks. 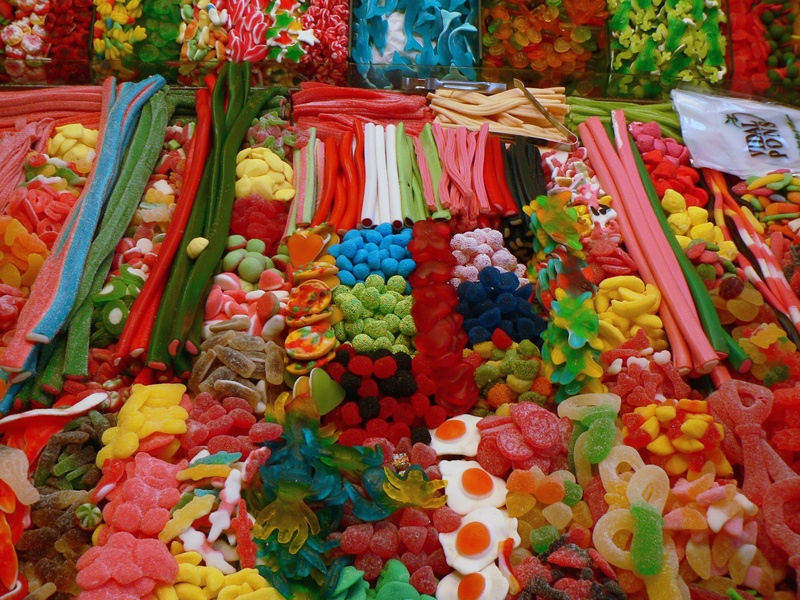 The post Getting Started With Open Pedagogy appeared first on How the Web Works. Posted in Blog Hub and tagged TWP15, twpweek1 on June 3, 2015 by Mo Pelzel. 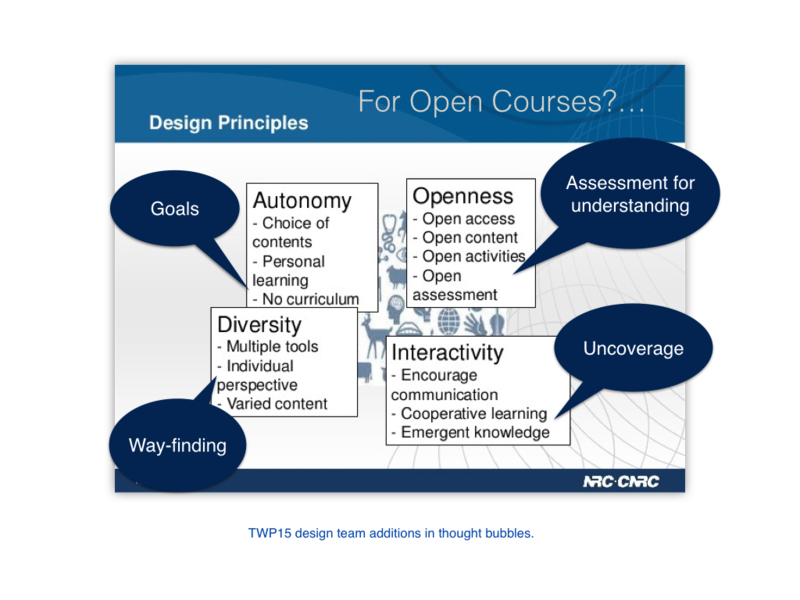 Some great discussion during the Open Pedagogy webinar earlier today about learning, design (pedagogy) and open. As soon as we have a link to the archive, we’ll post it on our Week 1 schedule. 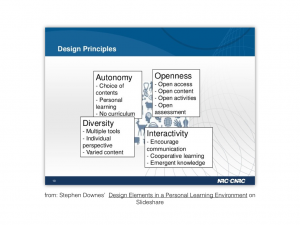 I thought this would be a good time to add to the discussion about designing open learning environments. If you managed to make it through the slideshow on this topic – bravo! If not, here’s a bit of an overview of the key ideas. You are designing a web, not a website. 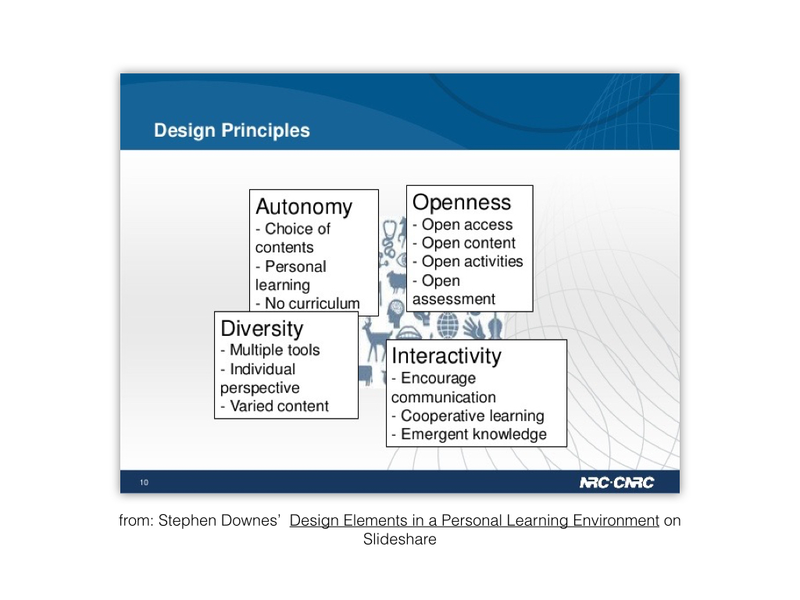 Stephen Downes, in his description of design elements in a personal learning environment, reminds us that a MOOC (for example) is a web not a website. This statement really resonates with me when I consider that the main focus in our work in developing this site (and other connectivist online learning spaces) focuses on the question “what can we do to support both the connections between participants and the sharing of what we are learning with one another?” And this is no easy task! The most challenging aspect is the careful consideration of the details that go into those interactions so that we can choose the approaches and technologies that best support them. Here are some of Downes’ key considerations and our additions. Click to enlarge the images. The concept of uncoverage is really just another perspective on inquiry – Mark Sample wrote a good piece about it in the Chronicle a couple of years ago: Teaching for Uncoverage Rather Than Coverage. And, while assessment for understanding may seem obvious, McTighe and Seif – explain why they think it is important to put understanding back into focus in our teaching and learning environments: Teaching for Understanding. 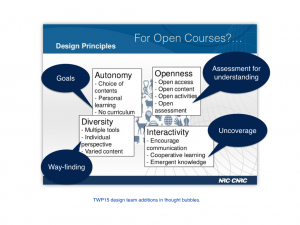 In thinking about your own context, is this a useful framework for thinking about the design of an open, online course? Are there other considerations that you would consider important? This is an open, online course for anyone who wants to connect and share ideas about teaching and learning with WordPress, in any context. Whether you have no experience teaching with WordPress or quite a bit, we all have something to contribute and can all learn from each other. Indeed, we expect that you will get as much or more out of your interactions with other participants than you do from what we have provided through the readings, videos and other resources. And we hope that your connections and discussions with other participants will last beyond the official end of the course. Ideally you would finish the course with a few people to add to your own learning network! For each week we have provided suggested readings and activities, but we would like to stress that you should feel free to read, discuss and do what you find most useful, even if it’s very different from what we have suggested. In fact, please contribute links to resources that you find useful, informative or provocative. You can share them in our Resources section.Focus on your learning goals and do what you need to fulfill them, and invite others to discuss and collaborate with you. We encourage you, therefore, to raise your own questions or topics for discussion on your blog posts and on Twitter if you feel that would be useful. Others might find it useful too! We have put together a bit of a guide to help with setting up a blog on WordPress, with using Twitter if you’re new to it and want to start, and with creating videos (which you may want to do later in the course). You can keep up on the activity in the course, by adding any one of the course feeds to your reader. You’ll find them on the lower right column. And if you don’t know what an RSS feed or reader are, and you want to, why, just ask, whether on Twitter (#TWP15) or on a comment on one of the “weeklies” (discussion pages), or reply back to this email! 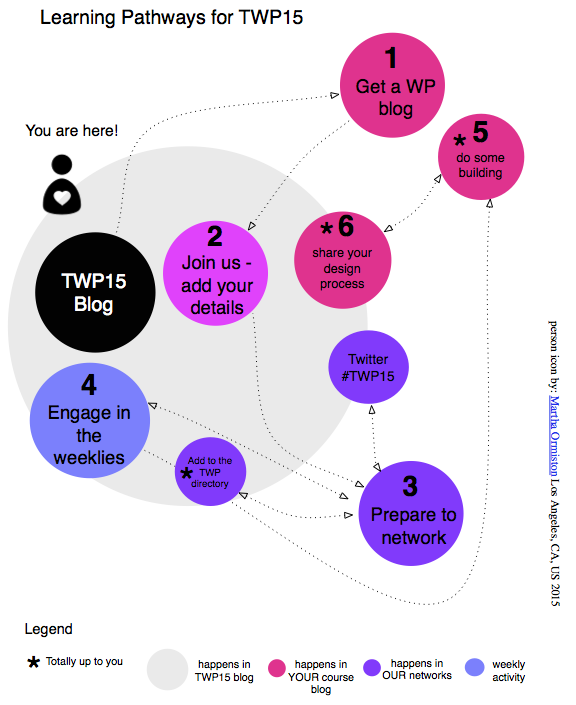 If you have a Twitter account and want to join us on Twitter, our course hashtag is #TWP15. We hope you’ll tweet at least one “big question” each week to engage all of us (including your own networks) in what your grappling with. What’s Up in Week 1? Join us for our kick-off webinar! Monday, June 1, 12:00-13:00 Pacific/ 15:00-16:00 Eastern/ 19:00-20:00 UTC. 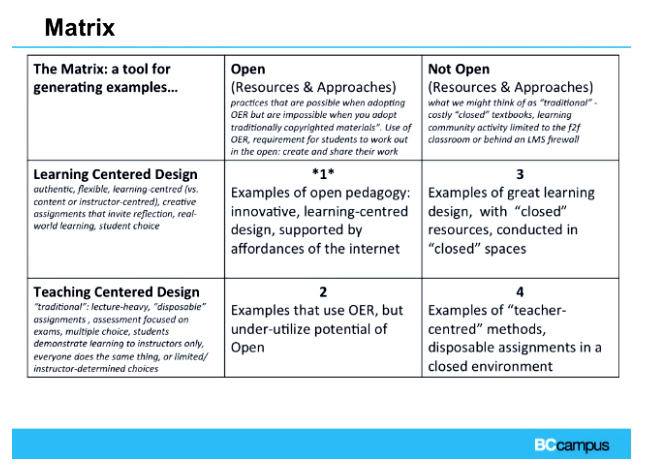 Amanda Coolidge, Mary Burgess and Tracy Kelly from BCcampus in Canada (http://bccampus.ca) will help us think through what open pedagogy is/isn’t and what it might look like in practice. See the week 1 schedule for a link to join when the session starts and for details about suggested readings, resources, and activities for the week as we focus on Open Pedagogy and Design. George Siemens, is an educator and theorist in the field of digital learning and is the author of the article “Connectivism: A Learning Theory for the Digital Age” and the book “Knowing Knowledge“. 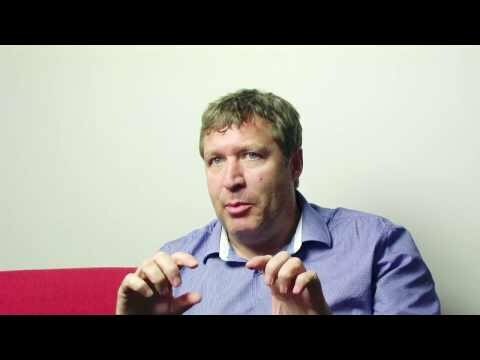 He provides an overview of connectivism in this short interview for the University of the Sunshine Coast, Queensland, Australia. Stephen Downes: Connectivism as a Learning Theory.